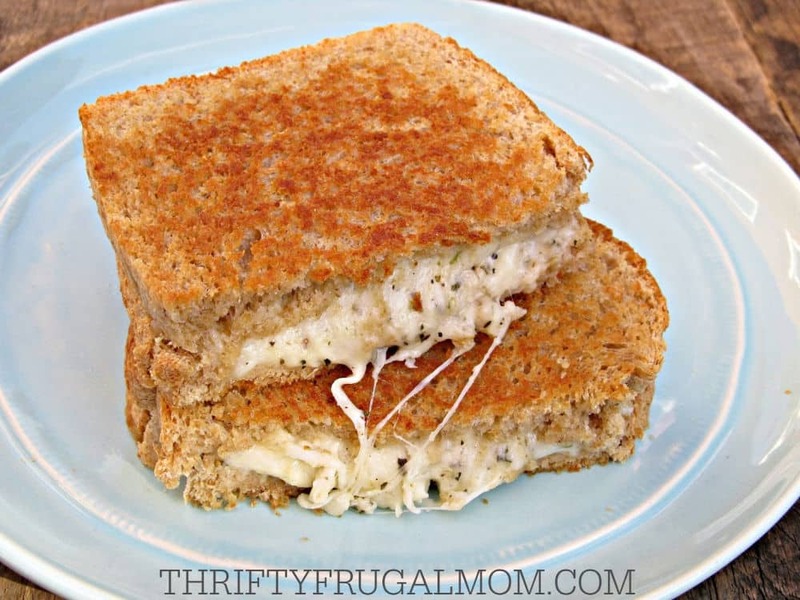 The best grilled cheese sandwich recipe ever!! Loaded with 3 different kinds of cheese, garlic and herbs, it’s the perfect comfort food. This shop has been compensated by Collective Bias, Inc. and it’s advertiser. All opinions are mine alone. It’s probably safe to say that we are kind of soup fanatics around here! During the cooler months, soup typically appears on our menu several times a week. Not only is it perfect comfort food during chilly weather, it’s also frugal and helps us stay within our $200 grocery budget. Something that we love even more than soup though is cheese! During the winter months I always feel like our taste buds get to have a party since cheese is the perfect pairing for soup, and as a result, we enjoy them together quite frequently. 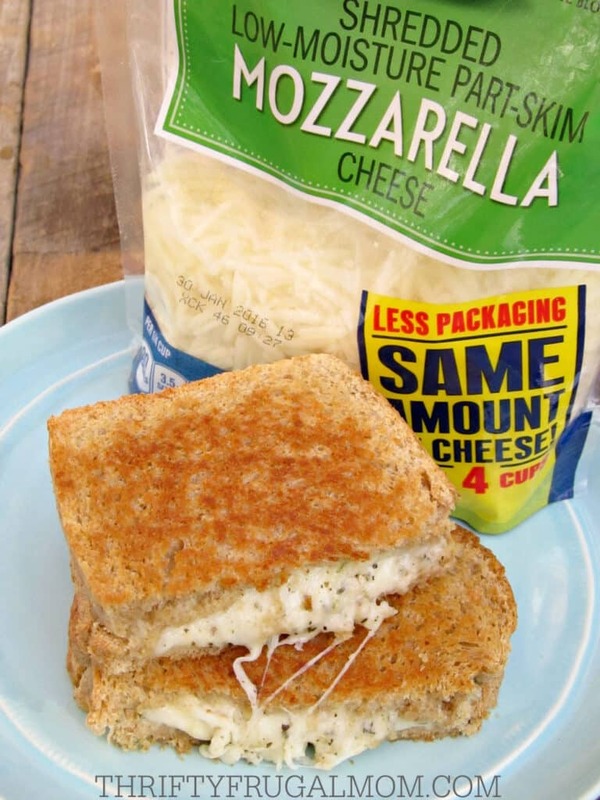 I recently bought some Kraft Natural Mozzarella Shredded Cheese to make one of my favorite “cheesy” recipes– White Pizza Grilled Cheese Sandwiches. Seriously, people, you have not lived until you’ve tasted these sandwiches oozing with cheesy goodness! Okay, so maybe that’s kind of an extreme statement, but you get the point. These sandwiches are amazing. Stop and think about it. How could you go wrong combining three kinds of cheese with a bit of garlic and herbs and then toasting it all between 2 slices of bread until the filling is all gooey and melty and the bread is deliciously crisp? You simply can’t! Because we all know that melted cheese is pretty much cheese in it’s best form. As I already mentioned, I love pairing these White Pizza Grilled Cheese Sandwiches with one of our favorite soups for a satisfying easy homemade meal. And since they are packed with protein, I also sometimes serve them as the main food at lighter meals, too. Of course, they make amazing party appetizers, as well. Cut them into smaller, bite-sized pieces and you instantly have a fun, finger food! The best grilled cheese sandwich recipe ever!! Loaded with 3 different cheeses, garlic and herbs, it's the perfect comfort food. If using large curd cottage cheese, blend until mostly smooth. Combine cottage or ricotta cheese with olive oil. Add garlic, basil, oregano, salt, pepper and Parmesan cheese; mix well. Lightly butter each slice of bread. Place half of the slices, buttered side down in a skillet or griddle. Divide cheese mixture evenly between the slices in the skillet. ** Top with remaining slices of bread, making sure to leave the buttered side up. Cook over medium heat until bread is lightly browned. Flip, and cook remaining side until lightly brown and cheese is melted. * If you have time, for a fuller flavor, mix up the cheese part several hours ahead of time. ** You want the cheese mixture to nicely cover the surface of the bread, but don't pile it too high, because you'll end up having a hard time keeping the sandwiches together once the cheese melts. Are you a cheese lover? What’s your favorite grilled cheese sandwich? Yum! I love a good grilled cheese! I like to make mine with a bit of cream cheese (or Laughing Cow cheese, thanks to a recent sale) and then layer on whatever varieties of cheese I have in the fridge. And I sprinkle the outside with a bit of parmesan cheese, too. Oh, that sounds like a great grilled cheese version too, Kristen! I bet the cream cheese makes a bit creamier than just an ordinary grilled cheese sandwich. After I created this White Pizza Grilled Cheese version several months ago, I started wondering why I had never thought to get creative with my grilled cheese sandwiches before! funny you posted this this week. Our office has decided to have food trucks for us to get lunch from since we only get 30 minutes and the only thing close is Chick-Fil-A and Taco Bell. Any way one of the food trucks this week is called Just Say Cheese and it's all about grilled cheese! I don't typically eat from the trucks since I bring from home everyday...but I can say this is one recipe I would love to try. I love grilled cheese with velveeta. My husband will eat it any way I serve as long as it has tomato soup as it's companion. Thanks for sharing this recipe! Oh, I think I would like that food truck! ;) It would probably be an occasional splurge for me, I'm afraid. And I grew up with grilled cheese made with Velveeta and still think it's a yummy way to make it. Thanks, Stephanie! I know all about needing to find filling recipes for a family of 5. :) And when I have a recipe like this that is a hit with everyone, I always feel like I've really done well! Yes! We make something very similar we call Pizza Grilled Cheese. We do mozzarella, garlic salt from Aldi, and tomatoes or pepperoni or other "toppings" in the middle. I'm going to try your version with the cottage cheese for the extra protein. This sounds ridiculously amazing. We have leftover soup in the fridge, so I will definitely be making these to go with it. Thanks so much!! If your boys like cheese and garlic, then I think they'll love this! My kids always get excited when they see me making them. And yes, they go perfectly with tomato soups. Look at that cheesy goodness! 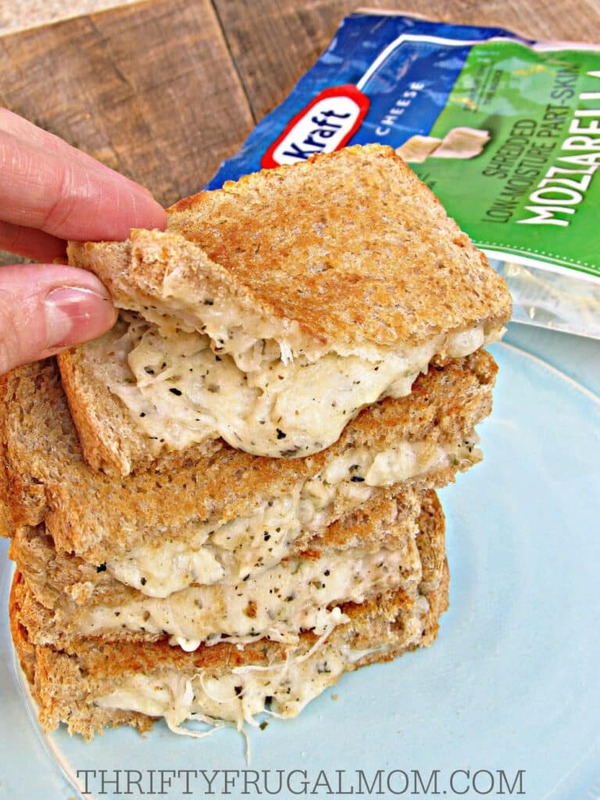 I never thought to use ricotta or cottage cheese in my sandwich, but I have to try it. Such a great idea! I know, it kind of sounds a bit odd, but it really is so yummy, Thao! Looks delicious! Thanks for sharing. I'm definitely pinning this! I think they'll be a hit, Sara- at least they were with our kids! You aren't kidding about the gooey goodness! I'm drooling over here! I'm super crazy for soup these days too.. there is a store here called Darn Good Soup and I've been popping in at least once a week haha. Too good! I should not have read this right now. I'm so hungry and this looks delish! What a great idea! We love soup in our family as well. Thanks for sharing on the Shine Blog Hop! :) High five from one soup lover to another! And you definitely should try these sometime when you need something to go with your soup. So yummy! Thanks, Nena! It's definitely fun to spice up an old classic sometimes. Looks absolutely delicious! Love creative grilled cheese sandwiches. I want to try this but done need 5 sandwiches. Could I freeze them? Kendra, I've never tried freezing them so I'm not sure how it would work. I'd be a little nervous that the bread might get soggy as they thaw since freezing cottage cheese tends to make it a bit more watery. If you don't want to make the full amount at one time, you could either half the amount of ingredients used (which would make you half the amount of sandwiches) or if you want to make the full amount, I'd recommend just freezing the leftover filling. It should freeze pretty well, although it might get a tad thinner once it's thawed due to the cottage cheese issue I mentioned above. But I don't think it would make a difference for your sandwiches. Hope that helps! Thanks for the response! I'll half the recipe. Can't wait to taste them! Oh my! This is a great idea. It looks absolutely delicious! Oh, yum! This looks amazing! I love grilled cheese and can't wait to try this. Pinning and saving for sure! Thanks for sharing at Family Joy Blog Link-Up Party. Have a great week! This looks so good, but I would have to do something other than the cottage cheese. I couldn't 'go' that.